This is a project that has roots to back about 2 years ago. I wanted a quality headphone amplifier to be an addition to my Hi-Fi stereo system. It was to be something to use when I didn't want to disturb everyone else in the house. I tried several different tube types in the amplifier design process. I used 6J6, 12AU7, 6SN7, 6CG7/6FQ7 and 12AT7. Generally all worked, but none seemed to have either the needed output level or didn't match well (likely to the choice of transformers) and sounded on the dull side. The 6DJ8 (ECC88) dual triodes worked like a charm. They had the combination of sufficient current flow, modest voltages on the anodes (important for the matching transformers) and enough gain to make the amplifier sing. The next best tube type was the 6CG7/6FQ7. Almost as good, but they are getting a bit scarce and the new production JJ E88CC are now quite common and reasonably priced. I am sure other triodes could be used and there is no reason why a high impedance ( on the primary side) small push-pull output transformer would not work. I doubt that you can find one much cheaper than the matching transformers I used. Certainly not with similar response and distortion characteristics. This low power tube headphone amplifier is designed along the lines of the Oddwatt power amplifiers, except that this headamp does not require a driver stage. All the circuit gain is in the single output stage. Once again I used a constant current source (CCS) IC in the cathodes but since only low power levels were needed there is no provision for balancing the load between the two triode sections. None was needed either as the output is quite symmetrical to levels way above anything you could use with headphones. I wanted simplicity in the circuit. It has neither coupling capacitors nor any feedback loop. In fact there are a total of only 7 components including the tube in each channel. The power supply, alas, has many more components. This is common in many of my designs. I find that a very clean power supply is essential to achieve high quality audio performance. Approximately 100 millivolts (mV) of signal input will result in about 50 milliwatts (mW) of output power. This is much more output than is needed for really excessive sound levels with most headphones. The audio output transformers used are Edcor XSM10K/150. These transformers are designed for line level matching and are rated at 2.5W with a center tapped primary impedance of 10k and a center tapped secondary of 150 ohms. These impedance values lend themselves for use with many Hi-Fi headphones. While there is some loss of efficiency in using headphones below 32 ohms on the 75 ohm tap there was minimal effect on the quality of the sound. For use with higher impedance headphones you can use the Edcor XSM10K/600. The primary impedance of the Edcor XSM10K/600 is 10k with a 600 ohm center tapped secondary that is ideal for use with 300 ohm and 600 ohm headphones. The power supply provides direct current (DC) for the tube heaters and a well filtered B+. I believe that using alternating current (AC) on the tube heaters would also be just fine, but since I have the PCBs and components to get the DC, that is what I used. Aside from the Edcor transformers, most of the required parts for the tube headphone amplifier project can be sourced from the likes of Parts Express and MCM Electronics, among others. To help you along with the construction of the tube headamp here are some suggestions for design and construction tips for vacuum tube amplifiers and the tube amplifier wiring color code I use. 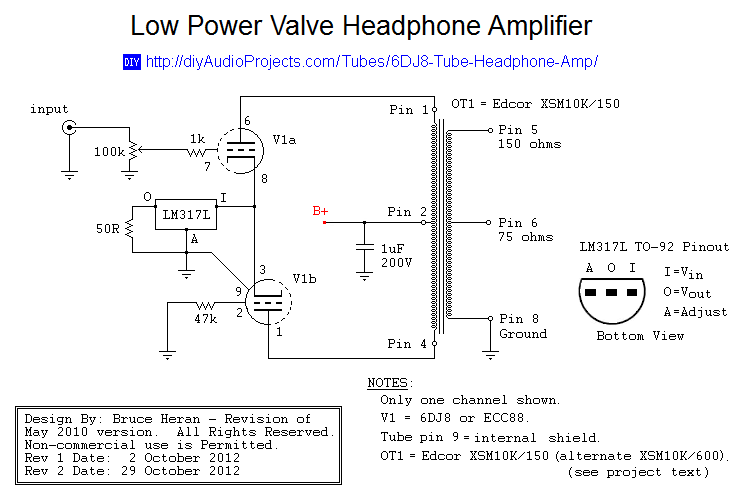 Warning: This tube headphone amplifier project uses high voltage in the 250 to 270 Volt (V) range. Contact with voltages of this magnitude can cause serious injury or possibly be fatal. If you do not know how to build projects that have these potentials or you are not comfortable in with projects that use these voltage levels, I strongly recommend you do not built this headphone amplifier. As always, please follow your governing electrical code for all wiring and connections. Construction of the headphone amplifier is straight forward and uncomplicated. The layout of the circuit is not critical as the amplifier gain is relatively low. The PCB and chassis you see in the photographs are left over parts from Forewatt 12AU7 Tube line stage preamplifier prototypes. Being somewhat frugal, I tend to use parts that are available. The 1 uF and 0.1 uF capacitors in the circuit should be "poly" types. The 0.1 uF capacitors across the tube heaters can be low voltage ceramic types. For best performance the 1 uF capacitor shown on the amplifier section near the audio output transformer should be physically located close to the actual B+ connection on the audio output transformer. You can use the standard size of LM317 voltage regulator in place of the LM317L which comes in a TO-92 transistor case if you wish. The power actual dissipation is rather small at about 75 mW. The 7806 voltage regulator used for the heater circuit should have a small heat sink as it will be dissipating a little over one Watt if you use the Edcor transformer shown in the schematic. I recommend against using standard type rectifiers in the HT (B+) power supply. The ultra-fast UF400X series rectifiers work far better and generate considerably less noise than the 1N400X types do and are nearly as cheap. The bridge rectifier in the heater circuit can however be a generic one. As always, be careful not to create ground loops. For more informations about grounding, see my article about grounding and shielding for your DIY audio projects. The amplifier will deliver over 100 mW of output into pretty much anything from about 32 ohms to 300 ohms. With the Edcor XSM10K/150 audio output transformers the optimum match is at 75 and 150 ohms. Using headphones with an impedance below 32 ohms will result in decreased performance as the load on the tubes will be below the best range. Above 300 ohms it will also be less than the best match, but many phones in that range seem to be more sensitive than those with lower impedance and it may not matter. The frequency response at the 50 mW level is from 20 Hz to 28 kHz within 0.5 dB and the wide band signal-to-noise is at -84 dB. I didn't run a full distortion series on the amplifier as the output levels are rather low (voltage wise) and the ambient EMI in my shop would tend to confuse the results. On a spectrum analyzer I was able to get as much as 2 volts output before there were obvious harmonics appearing on the display. At more typical listening levels (about 0.1 to 0.2 volts into 100 ohms) there was no sign of any harmonics above the noise floor. I would conclude from this that the actual distortion levels at such levels are well below 1%. Power consumption of the headphone amplifier is approximately 20 Watts (W). So to the important question - How does it sound? The sound in short, is excellent. With my heaphones - Koss Pro4AAT (250 ohms) and Sennheiser HD-280 PRO (64 ohms) there was no audible noise or hum and the response was rich and clean. I won't give up my electrostatic speakers and other gear to swap for headphones and the headphone amp but it sure is nice for those occasions when private listening is needed. The quality of the sound will depend a lot on your choice of headphones. The amplifier can not make cruddy headphones sound great but will sound great on quality phones. I found the sound particularity nice on my Sennheiser HD-280 PRO headphones. They have a rather neutral overall sound and a lot of detail. I have used them on other sources, most notably with my OPPO BDP83SE Blu-ray player. For those of you unfamiliar with the OPPO player, it earned a class A rating in Stereophile for audio performance. When I feed the output of the OPPO player into the headphone amp I can not really tell that the sound has changed in any obvious way. My conclusion is that the amp is pretty linear and clean. There is no hum and noise with the Sennheiser headphones which are rather sensitive. Solid bass, clean mids and highs, nice detail and obviously wide sound stage. I actually considered adding a blend control as I prefer some channel mixing similar to what you would have with speaker use. There are plenty of tube options as the tube headphone amplifier should work well with most the 6DJ8 / ECC88 and 6922 / E88CC tubes. I hope you enjoy this headphone amp project as much as I have. 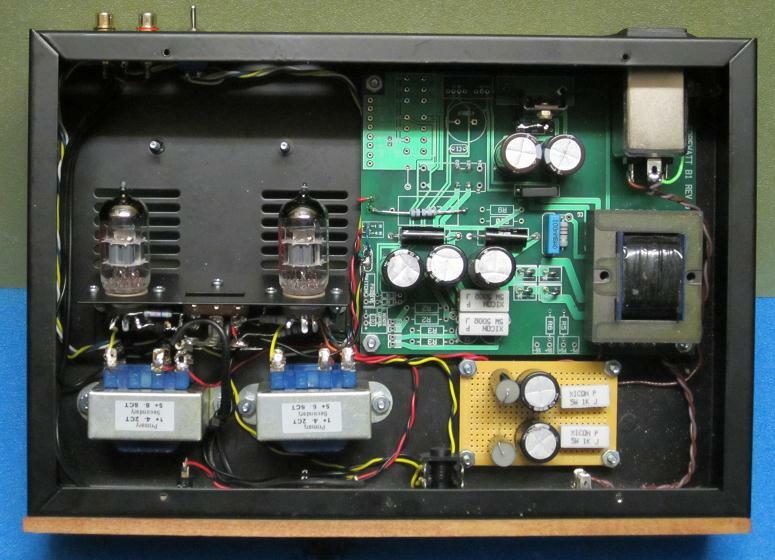 Comments and questions about this project are welcome in the 6DJ8 (ECC88) Tube Headphone Amp Project thread. Bruce Heran is the VP for Design and Support of Oddwatt Audio. He has been involved in the field of electronics in one form or another for nearly 50 years. 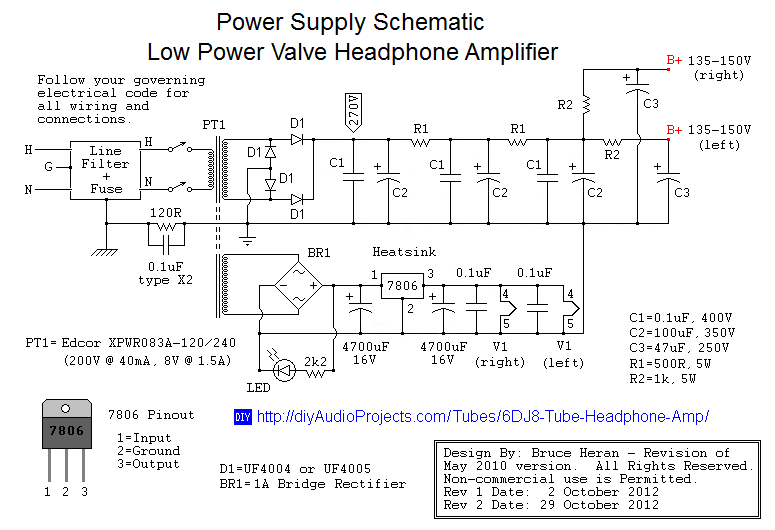 Bruce is a strong supporter of DIY audio projects and generally specializes in vacuum tube designs for Hi-Fi. One of his main goals is to educate and encourage new comers in the building of affordable high performance audio equipment.